Brett Martin, head professional at Eaglepoint Golf Resort in Kamloops, shares a few tips on getting back into the swing of things a bit earlier. So you’ve been stuck in the office all winter, watching the PGA tour and pining for the courses to reopen so you can get the clubs back in the trunk, right? You get out to the course, pull the driver out on the first tee, and everything goes wrong. You get frustrated because you swear you used to be okay at this game—must just be a bit rusty from all that time away. 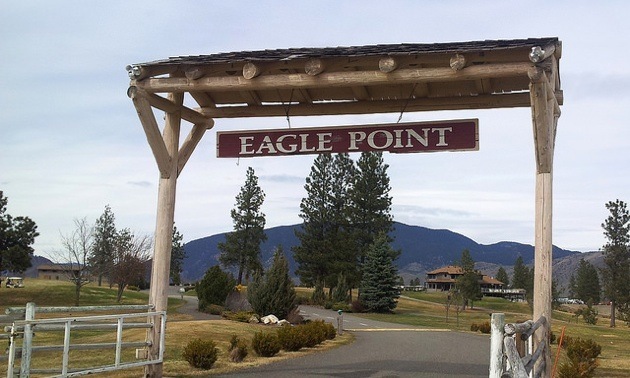 Brett Martin, head golf professional at Eaglepoint Golf Resort just outside Kamloops, B.C., has a few ideas to help shake off some of that rust a little sooner and get you back enjoying the game we all love. “Everybody wants to have their driver in their hands right away,” said Martin. “Start off with the lower irons to get into the swing of things and work your way up. You need to develop the inside-out, straight-back, straight-through swing, Martin said, which is easier with your shorter clubs because you’re not used to throwing your hands way out there early in the season. Once you get your inside-out swing path established with your shorter irons and get up to your longer clubs, you’ll want to focus on staying straight back as long as you can on your takeaway. According to Martin, the longer you can keep your club going straight back from the ball, rather than rotating too early and becoming flat, the better. A swing path too much to the inside causes large adjustments to be needed during the downswing, which can lead to inconsistencies in both contact and direction—not to mention the risk of pushing the face open during your readjustment and bringing that slice right back into play. Many golfers have issues early on in the season with the “feel” aspects of the game. They’re not hitting many greens (which those full-swing tips could help with), and they’ve lost some of their touch on their pitching and chipping efforts. The easiest way to get your feel back is to make use of the bump-and-run, according to Martin. This will not only help you gain your feel back in terms of the strength and speed of swing needed around the green, but also makes it easier to make solid contact. We’ve all opened the face to hit a flop shot and caught the ball half way up, screaming it across the green and needing the same club twice in a row. The bump-and-run builds confidence and allows you to build in more shot shapes once you’ve got some of that feel back. So gear down and get your swingpath straightened out before you start hauling off with the driver. Make use of the bump-and-run until you get your feel back around the greens. You’ll end up having more fun earlier in the season.